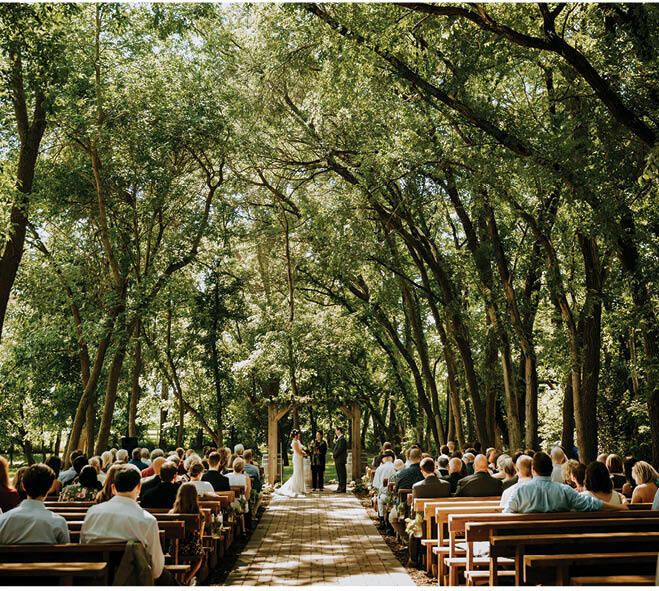 Minnesota’s breathtaking lakes, sweeping prairies and incredible foliage offer unparalleled wedding-day scenery. But Mother Nature can be moody and unpredictable. We turned to local experts for advice on hosting a spectacular outdoor wedding, no matter what the meteorologist says. “There is nothing better than having an awesome backdrop—the city, the lake, the woods, a floral vista. The fresh air and wind in your hair is outstanding,” says Nicolle Sellers of Mother of the Bride Wedding Planning & Design. She guided Jennifer and Adam Solomon as they planned an August wedding at the Lafayette Club in Minnetonka Beach. “I always joke that when we plan for bad weather, there is never any bad weather,” says Sarah Trotter of Lasting Impressions Weddings. That said, planning an outdoor wedding can be a bit of a roller coaster ride, so make sure that suits your temperament. Often the weather plan can change two or three times during the week of the wedding, based on the forecasts, says Trotter. Sellers and Solomon chose a specific time to make the final decision on executing the indoor or outdoor option. That way, they could stop obsessing over the weather report, setup could begin, and Solomon could relax and enjoy the day. “Knowing I didn’t have to make the decision until the day-of helped calm my nerves,” adds Solomon. Happily, they were able to enjoy spectacular views of Lake Minnetonka throughout their event. Solomon’s advice to couples planning an outdoor wedding? Have an indoor option that makes you just as excited. “If you can’t imagine your ceremony both outdoors and indoors, then it isn’t the right venue,” says Solomon. Trotter always creates a plan to communicate with guests. For example, if your outdoor ceremony option was the park but the indoor option is the reception venue, you’ll need to let everyone know. Make sure your plan is easy to execute quickly. Walk through your Plan B, says Irene Fleury, who, with husband Eric, recently held her wedding at the Minikahda Club, with planning help from Sellers. Fleury initially planned an outdoor wedding, but used her indoor option when it rained during the ceremony. Though not what the couple had in mind at first, they were happy with the cozy result. “We ended up having a very tight-knit, intimate ceremony,” she says. 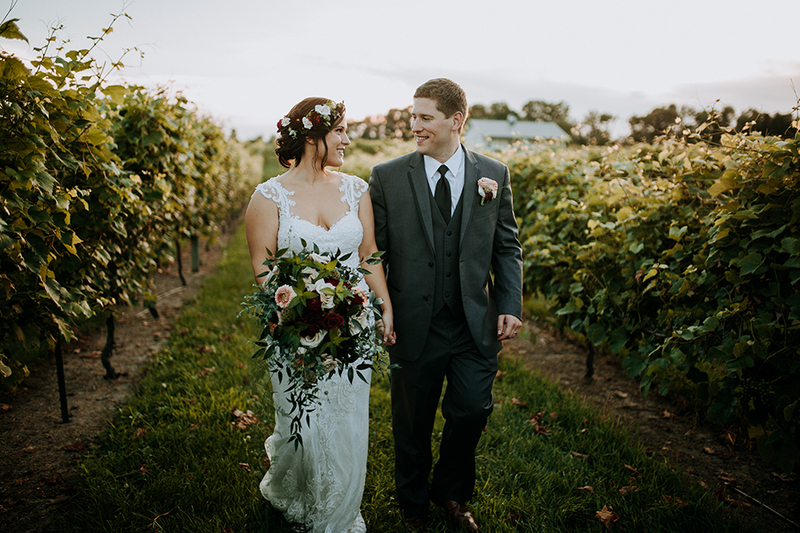 “We are thankful we were forced indoors, as everyone could hear the officiant and our vows.” Luckily, the sun came out during the reception, so they got to enjoy the beautiful patio space just as planned. There is romance to be had under the stars, too. “At one of our favorite weddings, the couple provided lanterns for all their guests to use when walking between the ceremony site to the reception dinner. It was a little bit of a hike, but it was a really romantic sight to see all the guests walking in the candlelight,” says Bollis. We’ve all heard horror stories about brutal heat, resulting in everything from wilted flowers to melted cakes. What do planners suggest to minimize or eliminate these problems? Don’t use clear-top tents, which trap heat and humidity inside like a terrarium, leaving everyone sweltering. Consider air conditioning or fans for the tent, especially for July or August weddings. Make sure to have plenty of ice-cold water on hand for guests. Don’t display a buttercream cake in heat. Store it under refrigeration until an hour before cutting, so it looks its best. Drape particularly sunny areas with canopies or umbrellas to create even more shade. Choose a tent all your guests can fit inside comfortably in case the entire event needs to happen there. An overcrowded tent quickly becomes stuffy. Regardless of the weather, umbrellas offer protection from sun, heat or rain. They can also be a unique decorative element. Choose flowers that hold up well in heat. Favorites include roses, hypericum berries, thistles, lavender and scabiosa pods. Quiz: 1 Is an outdoor wedding right for you? Questions to ask before planning an outdoor wedding. How do you feel about planning two different events? You will need to create Plan A for outdoors and Plan B for indoors. In some instances, you may even need Plan C and Plan D.
Are you going to be just as happy if you must go to your Plan B? Do you have guests who must use wheelchairs or walkers, or have special needs for asthma or severe allergies to bees? How easy will it be for these guests to navigate your venue? Where are you getting electrical power? Do you need a generator? How experienced are your caterers at outdoor setup? Does your venue have everything they need? What elements in your venue require extra thought? Do you need to add shade, fans or rain protection? Will you need to deal with mosquitoes or bees? Can your budget accommodate those additional expenses? Tents, canopies, fans and lights can all be arranged, but will add to your total cost, even if you don’t end up using them. Can your venue support those extras? You will need to confirm that your tent can be set up properly, and that lighting and sound equipment can be arranged where you want them to be. How much will the lighting change throughout the wedding? Make sure your photographer has all the necessary experience, time and equipment to set up artificial lighting. Plan your outdoor ceremony for later in the day so the sun is not shining directly on your guests. This also allows full advantage of the golden light of late afternoon and maybe even a spectacular sunset.